This Wednesday, April 22nd, is Earth Day. I recycle already, but have been trying to find ways to reuse things too. "These are the perfect shape and size! 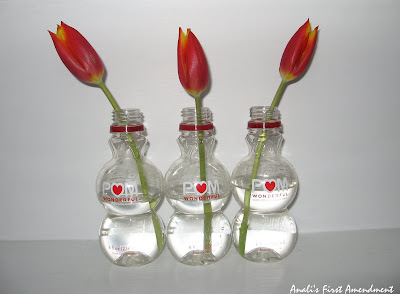 ", were two things that I thought immediately upon opening the package of POM Wonderful bottles. I always need small bottles to root plants. Since they will be out in the open for display for a period of time, I want them to look nice. In general, I also like to have containers like these to double as portable flower vases. You never know where or when you'll want to bring some flowers. So, if you buy POM's pomegranate juice, after you drink the juice, wash out the bottles and keep them to use for later. Another way to use Pom Wonderful's juice is to naturally color frosting. I always feel a little odd using food coloring. They contain more chemicals than I even want to think about. 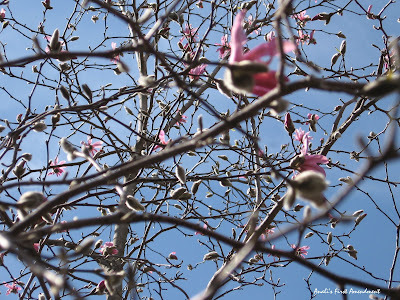 With the arrival of Spring, I've been thinking pink. And as always cupcakes. 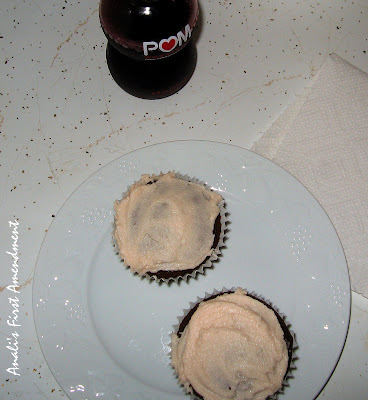 I could use POM's juice as a natural way to color the frosting pink and get a nice bit of extra flavor too. I used this chocolate cupcake recipe and the frosting recipe below. Combine ingredients in a medium bowl. Stir very well until smooth. Frost cupcakes. Enjoy! Anali's First Amendment © 2006-2009. All rights reserved. Beautiful, Anali! I love reusing glass containers like that. The POM ones are so cool with the tulips in them. So many bottles are too beautiful to just recycle in the typical way.